They say you're only as good as your last album. In the case of Ukrainian black metal collective Drudkh that happens to be A Furrow Cut Short. Also, people are discovering bands all the time so instead of trying to compare Furrow to the band's extensive catalog I'm going to take it for what it is; a spectacularly compelling black metal album full of strength, pride and reverence. With seven songs spanning almost an hour many tracks sound like epics, especially “Cursed Sons II” with its string arrangements, and four other tracks break the nine-minute mark. Furrow is definitely black metal but of a warmer sort. It's not bleak or icy, nor abrasive yet it still packs a measure of menace. That's mostly due to the paint-stripping rasps that contrast the otherwise majestic feel of the album. While the percussion consistently pummels and the tremolos soar on multiple levels, the atmosphere imbued by the many layers is what makes it so captivating. It's an album of constant motion where even in the quiet moments you feel as though you're falling through time. But as truly masterful melodies cascade and weave amongst themselves the mind is pulled in different directions, wanting to follow the beauty wherever it leads. However, it's not distracting. Despite being a lot to take in the listener stays grounded and assimilates the heart-rending expressiveness as a whole. One can feel desperation, longing, pain and struggle in Drudkh's ambitious arrangements, as if the music is driven from them by a force not of their own. And while somewhat hidden in the production, the bass is outstanding, laying down a muscular base to ground the timeless windswept melodies. On A Furrow Cut Short Drudkh hold the listener in an iron grasp, leaving them no choice but to let the music flow through their hearts. It doesn't bear down though. Instead it injects strength and confidence and lifts the listener to a higher plane especially where "To The Epoch Of Unbowed Poets" gets downright heavenly. In my opinion this is easily Drudkh's best work to date, or at least the one that has resonated the most. In a year of stellar black metal releases it may be easy to overlook Furrow but the way Drudkh are able to fuse drive and melody into such powerful songs should never be ignored. 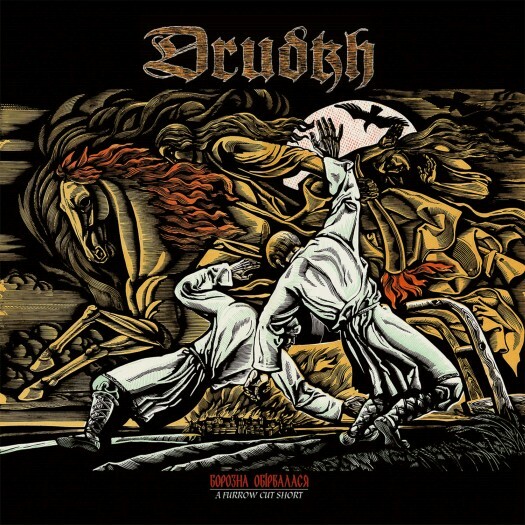 How can you say it's Drudkh's best work to date? Sure, it's good, better than Eternal Turn of the Wheel and the snoozefest Handful of Stars. But nowhere close to Autumn Aurora, Forgotten Legends, or The Swan Road. I respect your opinion, but have you not heard their old albums? Not all of them, no. I have failed you, sir. Best of the ones I have heard. How's that? Also "IN MY OPINION this is easily Drudkh's best work to date, or at least the one that has resonated the most." No worries, I still like you. Its a very very good album. Nothing beats Well, but this is rewarded by more and more listens. And I havent heard a poor album by these guys despite hearing them all.